More than a week remains of the Twelve Days of Christmas, and am I glad! The days leading up to and including Christmas Eve and Christmas Day flew by in such a flurry of church and family that I am fairly flattened. Today is the first of my restful days and I’m in happy R&R from wonderfully happy times. Here is a hodgepodge of photos and memories from the last two weeks, probably not in precisely chronological order. Of course, there were the doll clothes I sewed on for a couple of weeks, and did manage to mail to Littlest Granddaughter (working on a nickname for that one) on the 15th. An entire blog post will have to be dedicated to the small garments, later. I hear that the lucky dolly donned them immediately. Then K. and I went to San Francisco again with little T. who is now 5. 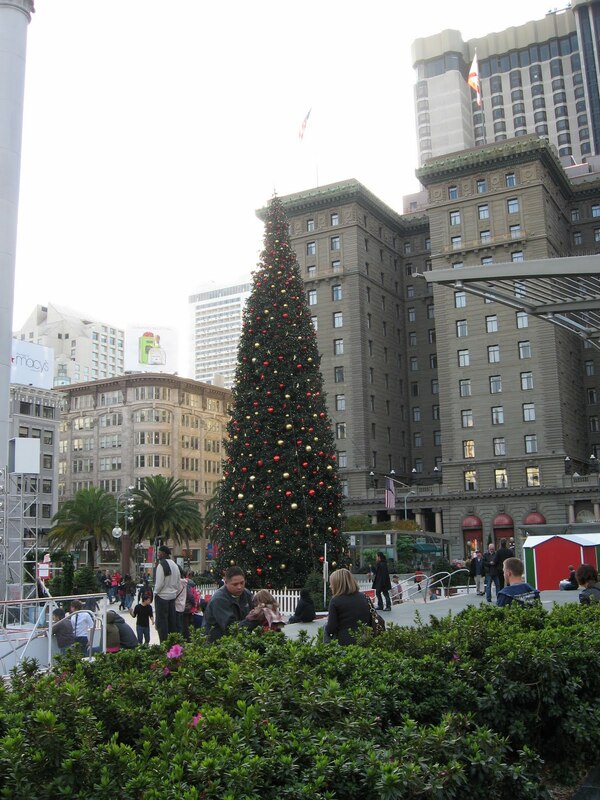 We did the usual cable car, Chinatown, and riding the elevator to the 31st floor of the Saint Francis Hotel to look over the city broadly and straight down at Union Square and the ice rink (photo). 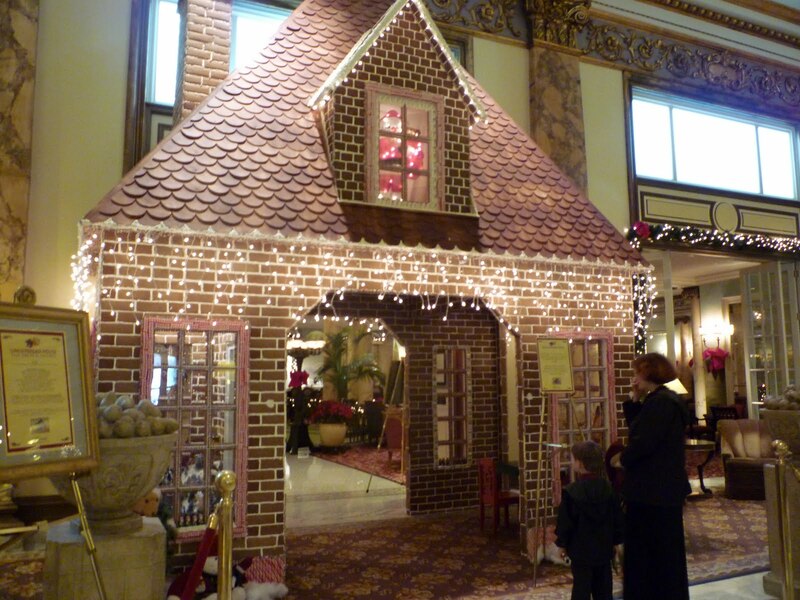 The gingerbread house in the lobby at the Fairmont Hotel was even more glorious this year, being two stories high. 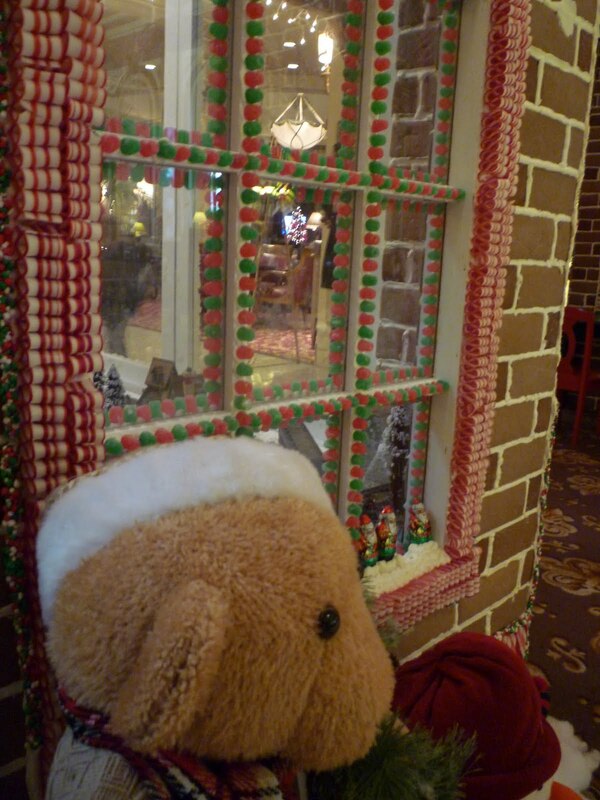 We were favored by meeting a baker who was doing maintenance on the candy that had already been nibbled by children. Last year there were signs asking people not to eat the house, but not this year. So evidently some have felt more liberty to partake, at least of parts that were protruding a bit; I didn’t notice any chunks missing from the gingerbread bricks. The baker repairman gave T. a chocolate Santa. 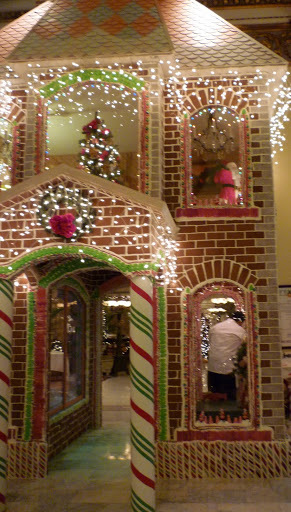 Not to be outdone, the Saint Francis Hotel had a giant sugar castle in the lobby there. After the San Francisco trip I mostly cleaned and cleared rooms to make places for six soon-arriving family members to sleep. We didn’t get our tree up until the day before Baby flew in, so she helped us decorate. One of my favorite ornaments is this doll who came from the Czech Republic just as the gifter had: our friend Tylda had sneaked across the border to Austria about the time I was born, when Czech was still joined to Slovakia. The little man is about 35 years old, the last remaining salt dough ornament of which B. and I painted and baked a whole set with which to decorate one of our first Christmas trees. He is looking a bit crumbly, as though his flesh is gradually vanishing into the atmosphere. Pippin and her family left the snow to come and be with us. “My” deer looked like this when she snapped their photo before driving down. Seventh Grandson Scout was way livelier than last year and entertained us all. We managed to keep him from falling down the stairs, and he was heard exhorting himself, “No, no…” not to bother the Christmas tree. His aunt gave him the perfect hat! Newlyweds Soldier and Doll were with us, too, for several days. Oldest daughter Pearl sent them darling Mr. and Mrs. Snowman ornaments that she made. 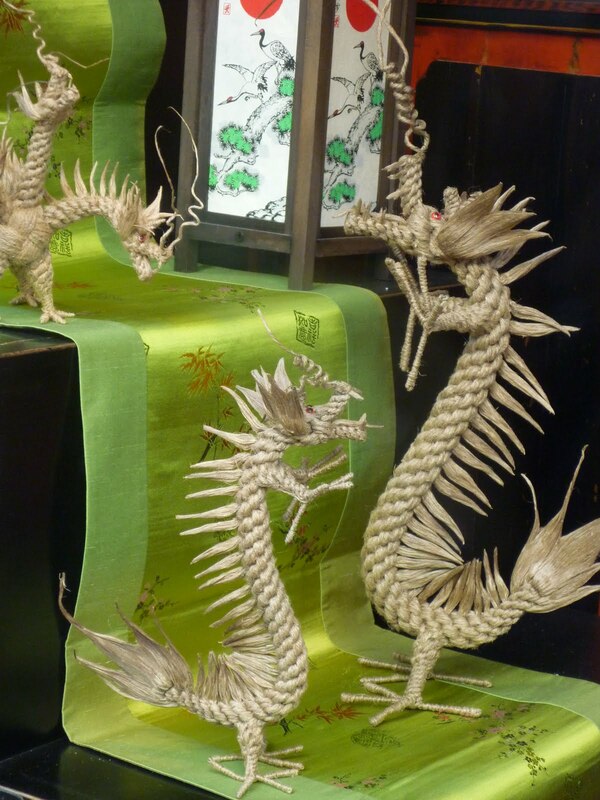 crazy-eyed marionettes brought from India last year by Kate. The married couples returned to their homes already, and as I write, we are nearing the departure of the last child and the return of Quieter Nest. But I plan to enjoy all the remaining days of Christmas, with meditations on the Nativity, and wait a while before I get out the After-Christmas to-do list I made a while back. Yesterday friend K. and little T. and I went to The City for the second of our annual Christmas outing. The St. Francis Hotel features an elevator with windows looking out on the Square, so we rode up to the 31st floor and down several times. 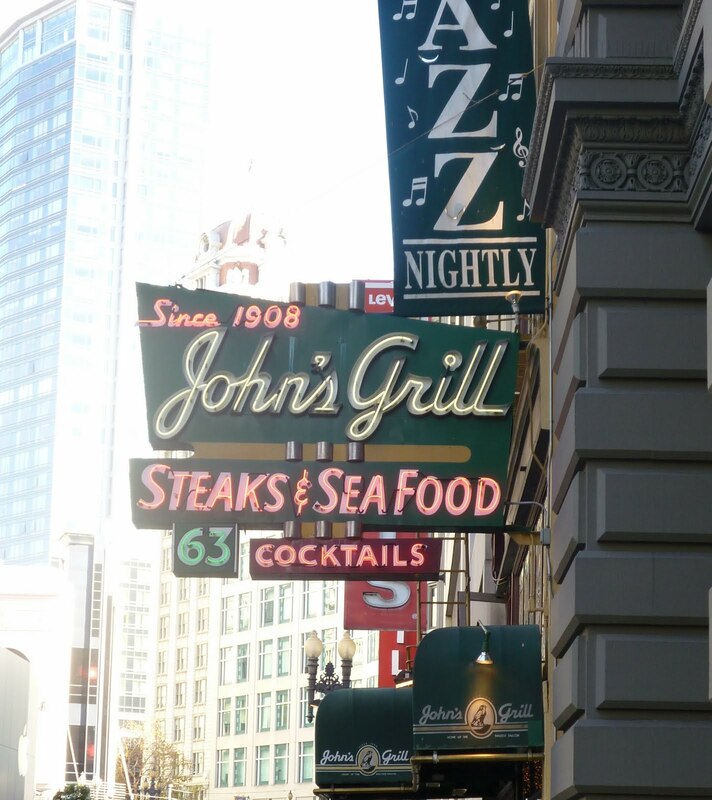 Then on to lunch at the famous John’s Grill. The restaurant has good food, and a replica of the maltese falcon from the movie by that name, hearkening to a scene from the movie shot in the restaurant. A couple of years ago the “original replica” was stolen, so this one is new copy. John’s Grill is a favorite spot for politicians to meet for lunch, and you can see framed photographs of various famous people all over the walls. 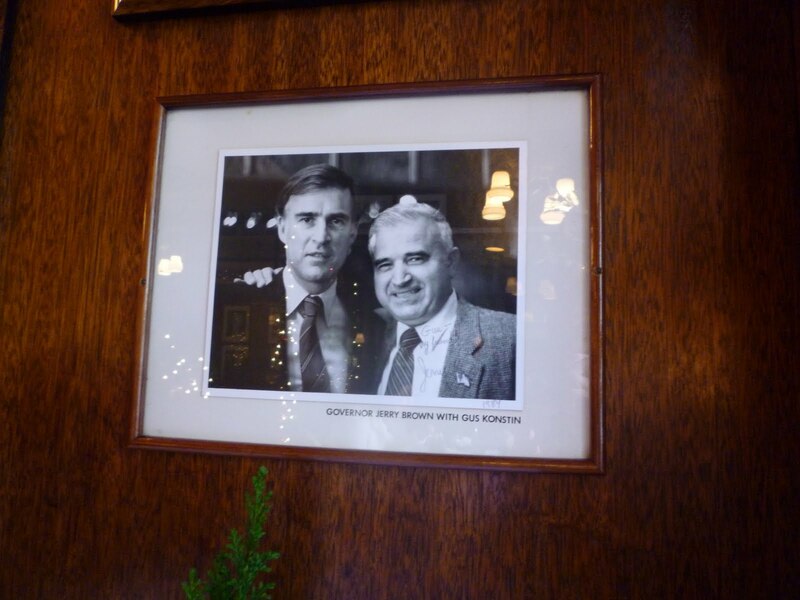 Right above our table was a picture of our former-maybe-future governor with a past owner in 1984. We rode the cablecar as we did last year. 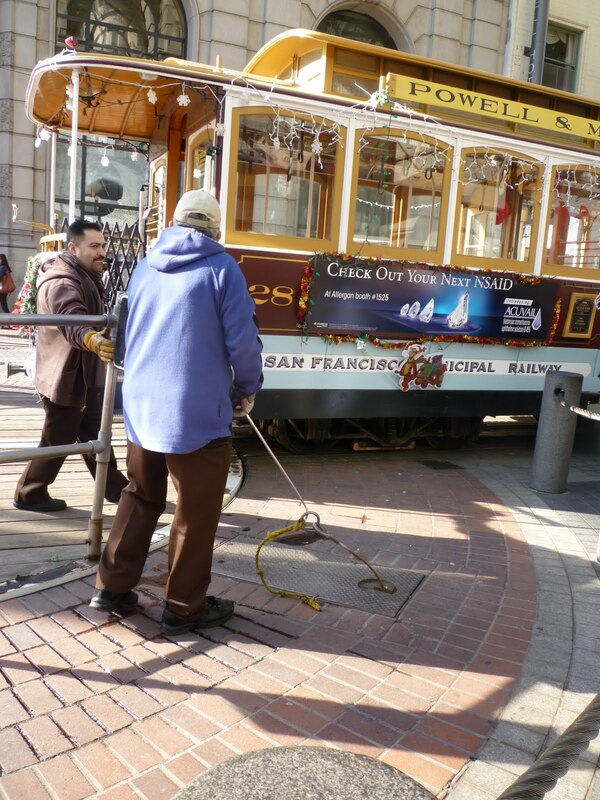 This time T. was happy to watch the guys adjust the cables at the end of the line and push the car into position for its return ascent. After a steep ride that had T. and me hanging on to our post and sliding down the seat nevertheless, we arrived on Nob Hill, where after the 1906 earthquake and fire, big hotels were built and named after the wealthy people whose mansions in that neighborhood had been destroyed. 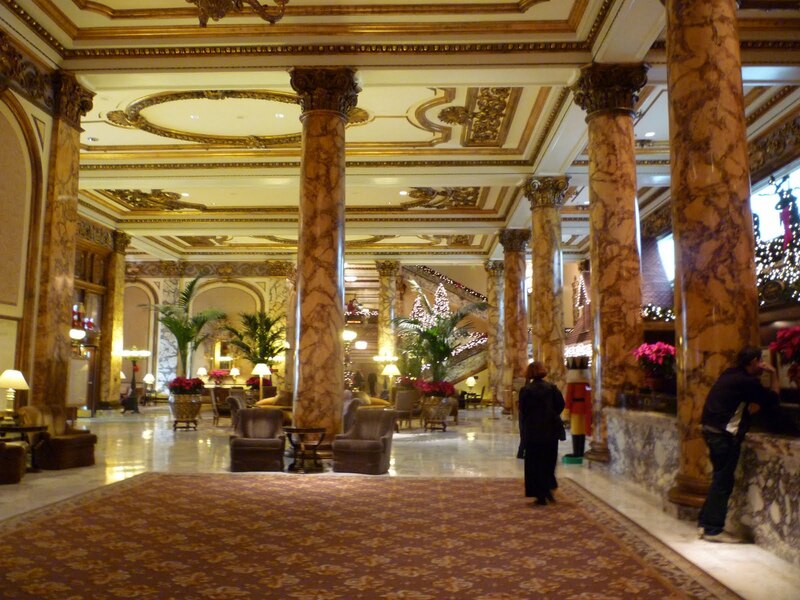 I enjoyed the grandeur of the Fairmont Hotel, its spaciousness and the marble columns. 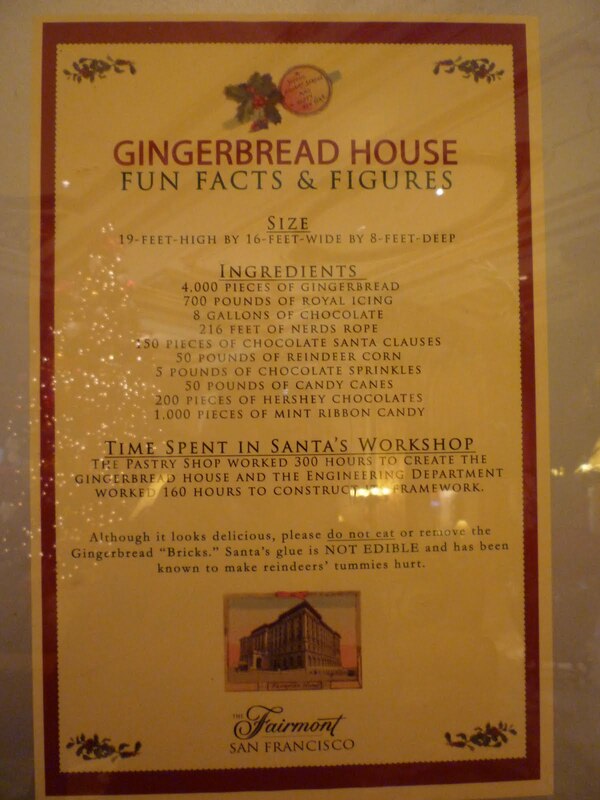 Even the gingerbread house was on a large scale, and made with real gingerbread and gumdrops, half a ton of ingredients and days and days of work. I was impressed by the silky evenness of the ribbon candy, as I’ve recently been on the hunt for some for my father-in-law. What I found in the supermarket is downright ugly compared with this. It smelled rich and gingery, too! 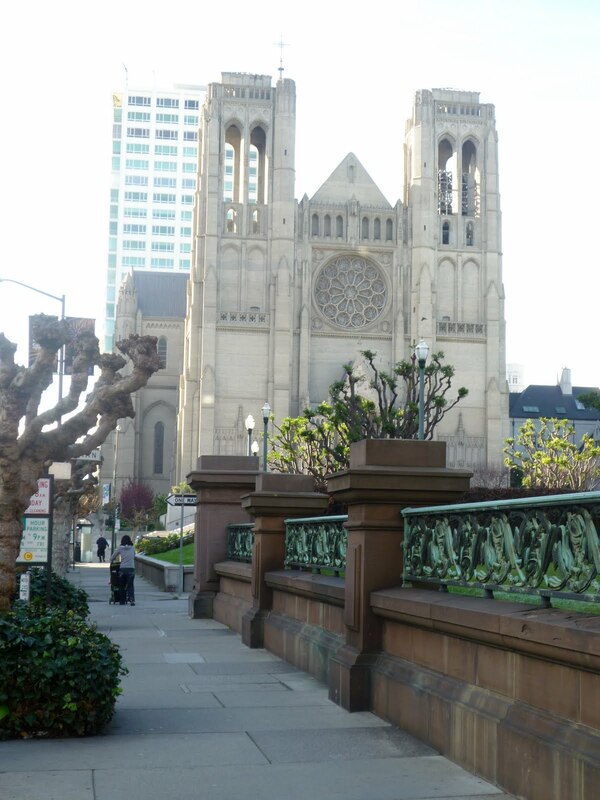 We were on our way to Grace Cathedral, also on Nob Hill. The original church was also destroyed in 1906, and the new cathedral not complete until the 1960’s. K.’s parents were married here. 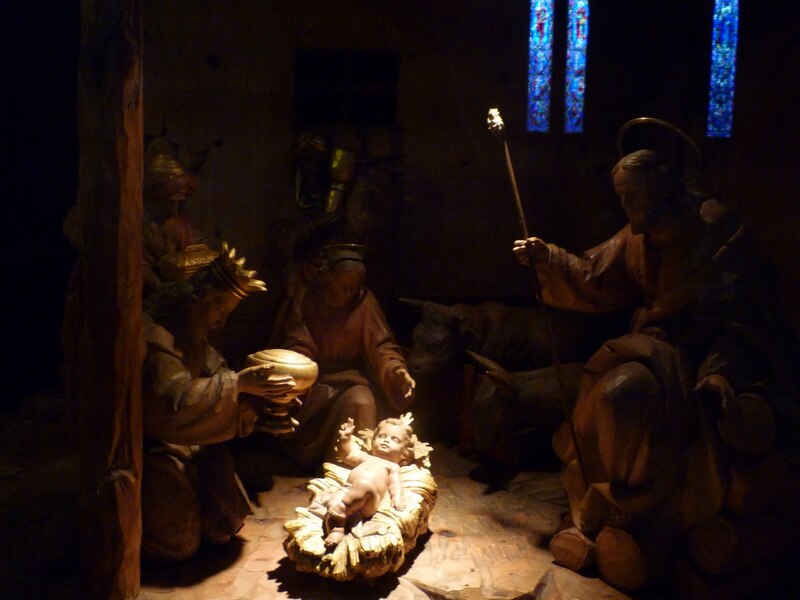 The crèche was my favorite part of our time in the cathedral. 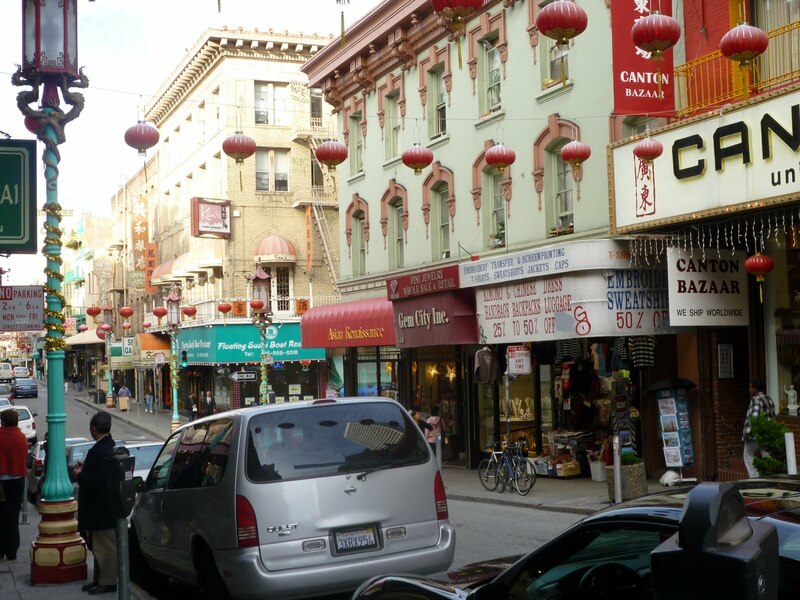 Chinatown brought us back to the hustle and bustle. 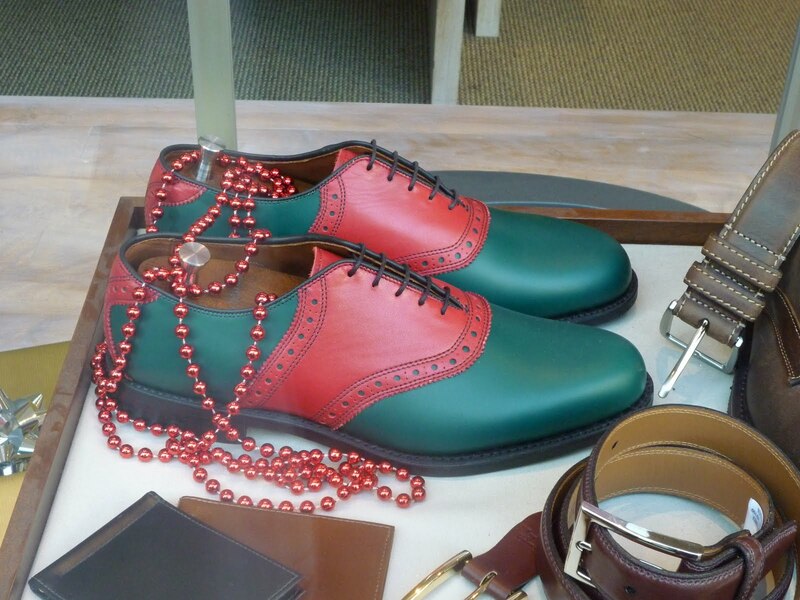 …and in another window, this year’s winner of the Christmasy Shoes contest. 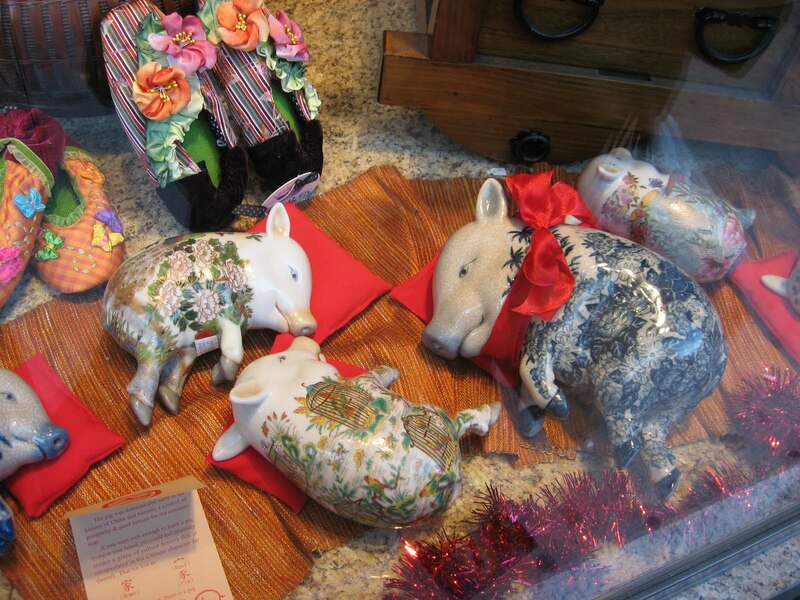 Last year I snapped pigs resting in a Chinatown window. They were there again yesterday–or had they ever left? Those pigs prophesied of this morning, when I slept late, dreaming that I was writing a novel. A relaxed outing, a lazy morning….it’s the last I’ll see of those for the next week. I’m going to enter the fray in earnest, now.